THE MAYBELLINE STORY : The Maybelline Story gives the reader heroes to cheer for and bad guys to worry about. The Maybelline Story gives the reader heroes to cheer for and bad guys to worry about. Sharrie Williams, author of the Maybelline Story has written a really wonderful book! Its an amazing story of once upon a time in America, where great desire, ambition and dreams overcome great adversity and obstacles. There is spirit, triumph mixed with tragedy as a company grows from nothing to world prominence in its industry. Written in an engaging, personal way so that as you read it, you are drawn in, and feel like you are right there with the family. 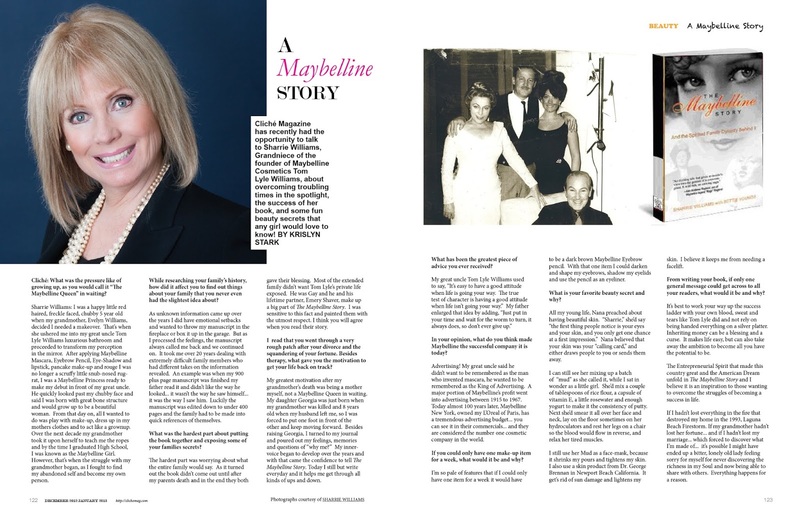 Maybelline (both the products and the story) interacted and evolved through the major cultural and dynamic historic events in American history and deeply it impacted everything from legendary Hollywood movie stars to every day working people's lives throughout so many generations. And there is an eternal verity that comes through as a constant theme: when you make a woman feel beautiful, there is a profound effect on everyone around her. Sharrie tells the story in a compelling way that makes it come alive, and also creates new stories that grow naturally from the main one." Larry Crandell, Santa Barbara California. eventually came through for each other. Our most recent book club selection.